The work will take approximately two to three working days, and is expected to generate noise and some dust. Measures will be in place on site to help mitigate this. Apologies for any inconvenience. Please take care if you’re near the work site. The road that runs from University Drive to Puaka-James Hight will be closed for the day on Thursday 25 January between the University Bookshop and Puaka-James Hight (see image below). This is due to excavation and trenching work being carried out. There will be no entry to the accessible car parks outside the south-east end of Puaka-James Hight. 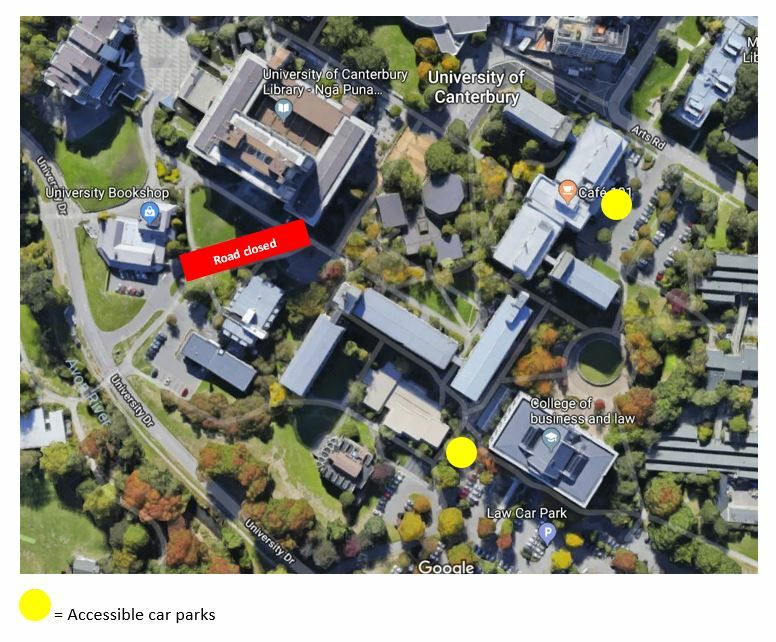 Please use the accessible car parks outside the South Arts Lecture Theatre or Psychology building instead. The University Bookshop car park will remain open. Please follow traffic management in place and take care when near the work site.